Just came back from a wonderful wedding at BeckenRidge Vineyard. 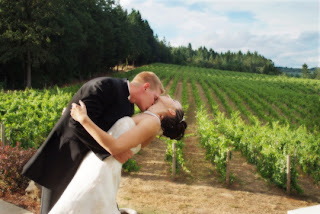 Mikki Pomerenke and Brian Trowbridge got married on the hillside overlooking the vineyard and our beautiful Willamette Valley. The weather was perfect, the couple was beautiful, the food was great (thanks to Occasions Catering) and the party was fun. What more could you ask for? We are always looking for the things that make the day go especially smoothly. Penny Parrot from Forever Yours Florals was actually there to pin the boutonnieres on the men. That was the first time I had ever seen a florist stay to do that! Neil and I so often end up with that chore because the florist dropped off a box of flowers but no one has a clue how to pin them on. It was delightful to get to meet Becky and Ken, the owners of BeckenRidge. They are taking a very “hands on” approach and were very helpful. Neil first met Mikki as a young teen when they were both in HMS Pinafore at the Salem library. We did her senior portraits a couple of years later and now her brother, Justin’s senior portraits and a wedding! We were blown away with how many guests we knew and had done portraits for. We felt like part of the family. Thank you Mikki and Brian!